If you don't know the history of Superman, Henry just caught you up in his latest post. We're not sure when the photo was taken, but if it's recent you know what that trailer and costume mean.. new Justice League scenes! The additional photography is set for this summer, and producer Charles Roven confirmed that Henry is involved. But he's also in the middle of filming Mission: Impossible 6 (that's about to resume production in NZ), so there is always the possibility this is not a new pic. Still pretty frickin' awesome! 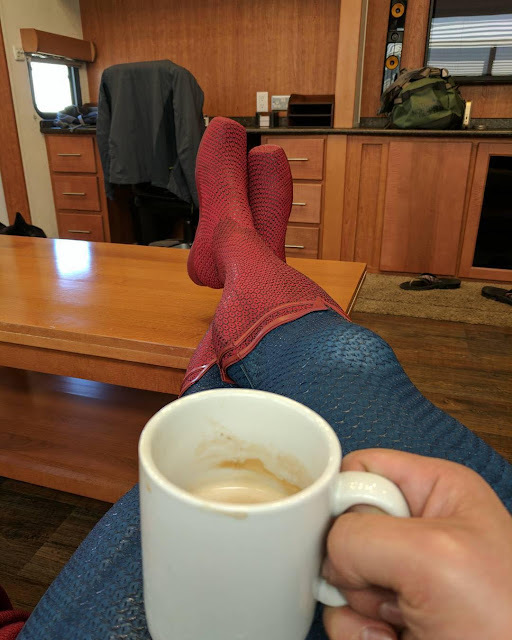 We'll be seeing more than a cup of coffee and those iconic red boots on November 17, when Superman "returns from the dead.." in Justice League. Henry also congratulated the Wonder Woman cast and crew for the film's huge success at the box office, that can only mean more buzz for JL later this year. This is definitely not a new pic. Henry is a bit lean for the suit and has a moustache. He more likely is in NZ shooting for M:I6 right now. Plus his hair is completely different too how he has it for Superman. You beat me too it @2:36 was gonna say the same! One could argue that CGI be used to match things out but that can only do so much. The physicality of Henry actually being there himself ways out far greater. Depends on the scenes needing to be shot really. Hello Again Mr Cavill. I have one of The Vintage Superman Comic Books. I just don't know what number or date it is. But it is one of the BIG COMICS. I will need to get it out of hiding to check. OKEEDOKEE. So much excitement! Hope Henry gets to see WW at some point. Not sure if he did yet! A glimpse of Supe's legs... yay!! Looking forward to seeing him in JL. Thank HC for the Superman trivia. D.